Jenny Lawson realized that the most mortifying moments of our lives - the ones we'd like to pretend never happened - are in fact the ones that define us...Lawson takes readers on a hilarious journey recalling her bizarre upbringing in rural Texas, her devastatingly awkward high school years, and her relationship with her long-suffering husband, Victor. 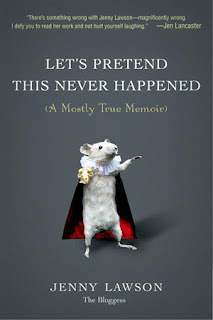 I thought I was done with comedic memoirs for the year, but then I was finally able to download a copy of Let's Pretend this Never Happened as a audiobook from my library and that idea went out the window. I've had my eye on reading this one for awhile, but it always seemed to be checked out. And then I preceded to laugh for the next three days. Lawson is hilarious, and strange, and awkward, and maybe a little creepy at times. But she's unapologetically herself which is absolutely refreshing. The memoir details her childhood in Texas with a father who likes to stuff animals all the way through the beginnings of motherhood and the tragedy of pet ownership. It comes down to this. I thought I was awkward, especially at small gatherings, but I'm no where near as awkward as Jenny Lawson. At least she (and her stalwart husband) have learned to accept and embrace the awkwardness. There's laughter and tears and acceptance that crazy is just a way of life. Lawson sings her chapter titles and talks about inseminating a cow and a gift from her father of a magical talking squirrel and a halloween party that did not end well. She tells you all about her crazy and in the end you see a woman that would make a great friend (if you like the kind of friendship where anything could happen). If you just want to laugh. Read this book. Or if you want to feel a little bit sane. Read this book. Or if you like taxidermy. Read this book. So just read this book.